Hakusan, Japan, November 25, 2015 – EIZO Corporation (TSE: 6737) announced that it has received FDA 510(k) clearance for breast tomosynthesis from the U.S. Food and Drug Administration for its 8 megapixel multi-modality monitor, the RadiForce RX850. Digital breast tomosynthesis is a method of breast screening that allows the radiologist to view detailed 3-dimensional images of the breast assembled from multiple X-ray pictures. When used in combination with digital mammography, tomosynthesis provides radiologists with multiple screening techniques that can be utilized together for increased diagnostic precision in breast cancer detection. 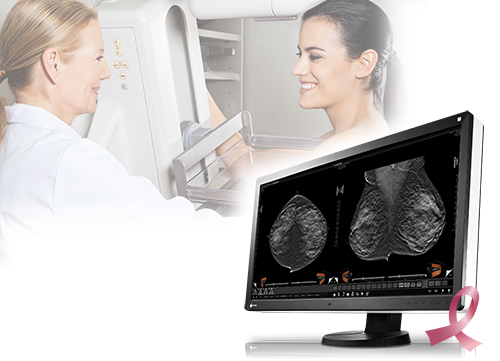 With FDA 510(k) clearance for the RadiForce RX850 in tomosynthesis, mammography, and general radiography, EIZO continues to provide a high degree of customer assurance to medical breast screening professionals and their patients. EIZO supports the pink ribbon campaign for early detection of breast cancer.